Oh yea, there’s also that life going on back in the northern hemisphere. 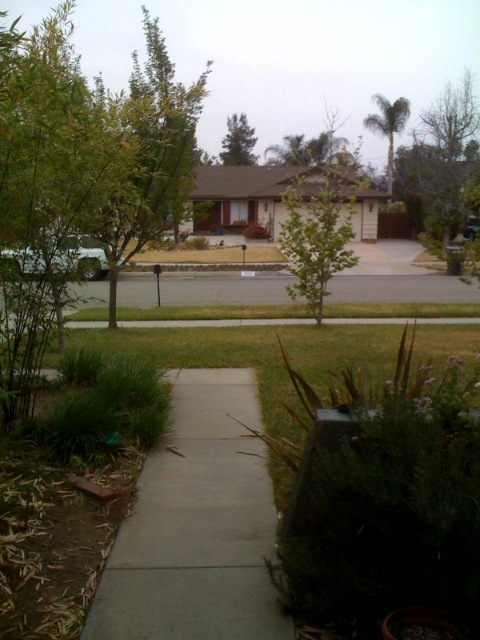 Like the sprinkler system whose settings still reflect winter conditions (ours is the dry and dying lawn across the street, photo taken from Kim and Steve’s front door). The decision about whether to pull up all (irrigated, non-native, water-sucking) front lawn grass and convert to other drought-tolerant plants may have been made for us! Though we can’t plant new things until late fall when the weather cools again. Now that Chris’s primary teaching responsbilities are over, he’s been prepping for the three classes he’ll be teaching this fall at Redlands. Last week we learned that he and one of his colleagues in Environmental Studies (Wendy McIntyre) received a grant from HP for teaching their field-based courses with new technologies (tablet pcs, gps, digital cameras, etc.). All good, and now they have to do the work! I’ve been trying to get him do write a guest posting on the blog. Send him an email (sinton@verizon.net) with encouragement. When we do return to California in 4 weeks, it won’t be for long. We “don’t work” in the summers, according to our faculty contracts, and by June 18 we’ll be in Vermont. Six weeks or so of travels, visits, and vacation around New England. When we’re in Middlebury we’ll also close on the Monroe St house sale, fingers crossed! Last month we signed the contract with mixed feelings: thrilled at the financial prospect of not owning two homes (not to mention the rented one in Argentina! ), but twinges of nostalgic regret for cutting off this tangible connection to our old life. The new owners will be incoming Middlebury faculty with young kids, and we have good images of their enjoying the home we built. Thanks to all the people in the States who are keeping this “life back home” running smoothly: Kim, Steve, Nathan, Monica, Theresa, Ingrid, and unnamed others. I send my appreciative thoughts of this while I am sitting in a neighborhood coffee shop (with wi-fi), sipping my café con leche, drafting the syllabus for my fall class on spatial thinking, an instant messaging with my sister in Mexico. Emily, my trusty companion, reads her book and comments on the people walking by. I’m thinking the people around here don’t worry too much about their grass turning brown.